Click image above to go directly to checkout and purchase with Credit Card. Click Buy Now Button for Credit Card, or the yellow button for PayPal. All Sales are for EazyDraw 9, upgrades at very bottom of this page. Description: EazyDraw expiring license valid for 9 months. EazyDraw macOS App electronic download delivery. Includes the application, extensive help documentation, examples, and tutorials. License purchase price may be applied toward the purchase of any full license version within 2 months of purchase. EazyDraw Version 9, free download updates for duration of license. Requires macOS v 10.13 or newer. License also valid for use with EazyDraw Retro for macOS versions 10.4 and newer. Description: EazyDraw macOS App electronic download delivery. Includes the application, extensive help documentation, examples, and tutorials. Version 9, single user license. Requires macOS v 10.13 or newer. License also valid for use with EazyDraw Retro for support of macOS 10.4 and newer. 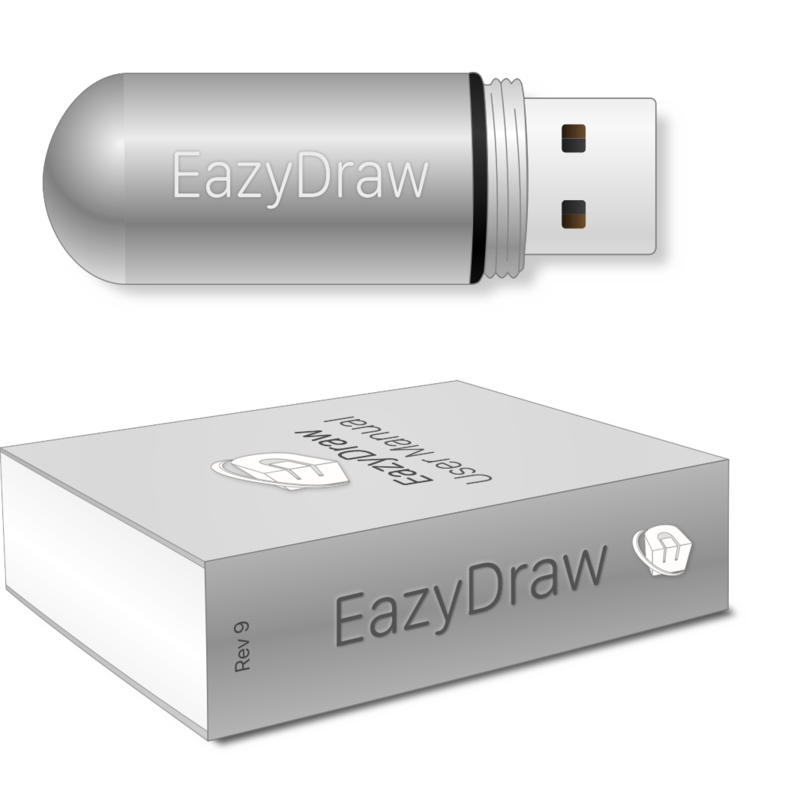 Description: EazyDraw macOS application on 16 GByte USB memory stick. 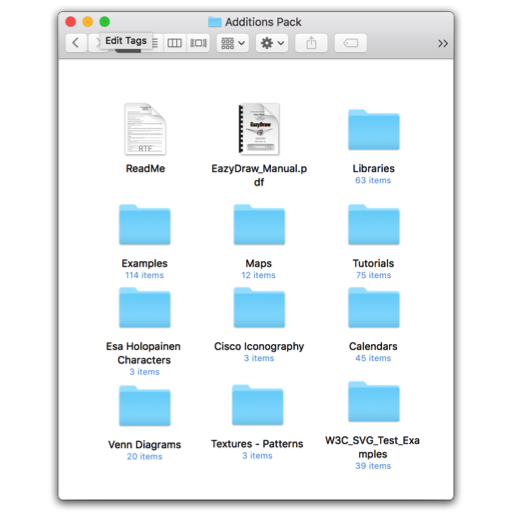 Includes the application, over 40 HD video tutorials, Additions Pack, user libraries, examples, and worksheet tutorials on the USB memory stick. Single user license. Memory stick contains: EazyDraw version 9 for macOS 10.13 and newer, and EazyDraw Retro for macOS 10.4 and newer. Free shipping by Priority Mail in the U.S., air post to other countries. Get started immediately: a temporary license and download links are provided by email. Description: Complete EazyDraw for macOS on 16 GByte high speed USB memory stick plus printed manual (400 pages). USB memory stick contains the EazyDraw version 9 and EazyDraw Retro version 9. Single user license. Memory stick contains: EazyDraw version 9 for macOS 10.13 or newer, and EazyDraw Retro for 10.4 or newer. Free shipping by Priority Mail in the U.S., air post to other countries. Get started immediately: a temporary license and download links are provided by email. Description: EazyDraw Additions Pack version 9, includes over 40 HD video tutorials on USB, libraries, vector maps, calendar templates, topic specific tutorials, and example drawings, pdf manual. Electronic delivery: 3 download links are provided by email, digital content download is 150 MByte, video downloads are 1.08 GBytes and 1.00 GBytes. 3.7 GBytes required total expanded local disk storage, Price includes free Additions Pack updates for one year from purchase date. Note: The Additions Pack is included with USB memory stick versions of EazyDraw, no need to order twice. Requires good internet access, others may consider a physical version. Description: Version 9 Physical Media with printed manual for versions 3 through 9 of the EazyDraw application. Plus pre-loaded 16 GByte high speed USB memory stick. Memory stick includes over 40 HD video tutorials. The manual is written in a read-along style and provides an easy to follow introduction to computer drawing with macOS. The manual is a detailed reference for more advanced techniques such as creating scaled drawings and configuring the user interface, there is one printing of the manual for all versions (3 through 9) of EazyDraw. Requires an easy-chair and lamp. Play HD Videos directly from the USB drive with Mac QuickTime Player or load on your Hard Drive. Free shipping by Priority Mail in the U.S., air post to other countries. Get started immediately: download links are provided by email. Description: Ten seat license package for EazyDraw. 10 users licenses for EazyDraw. The application, electronic pdf manual, extensive help documentation, examples, and tutorials. Licenses compatible with download versions and web updates. EazyDraw version 9 for macOS 10.13 or newer, and EazyDraw Retro for 10.4 or newer. Description: Ten seat Boxed package for EazyDraw. 10 users licenses for EazyDraw. Includes 2 USB memory sticks, 2 printed manuals, shipped with 10 user licenses for EazyDraw. The application, HD video tutorials, examples, and tutorials on the 16 GByte memory stick. Licenses compatible with download versions and web updates. EazyDraw version 9 for macOS 10.13 or newer, and EazyDraw Retro for 10.4 or newer. Description: EazyDraw expiring license valid for 9 months with Additions Pack. EazyDraw macOS App electronic download delivery. License purchase price of $20 may be applied toward the purchase of any full license version within 2 months of purchase. EazyDraw Version 9, free download updates for duration of license. Additions Pack version 9, vector content and HD video tutorials content as download disk image - requires good internet access, 4.0 Gigabytes of local storage. EazyDraw version 9 for macOS 10.13 or newer, EazyDraw Retro for macOS versions 10.4 (including PowerPC) and newer. Description: EazyDraw download version with Additions Pack. EazyDraw macOS App electronic download delivery. Version 9, single user license. Additions Pack version 9: HD video tutorials, vector libraries, vector maps, calendar templates, topic specific tutorials, and example drawings. Requires good internet access and 4.0 Gigabytes of local storage. Solutions for macOS versions 10.4 and newer. Those without good internet access may want to consider one of the flash drive versions. Description: License upgrade from 9 month trial license to full Single user license. Purchase of 9 Month trial license in previous 2 months required. Description: License upgrade from 9 month trial license to the USB memory stick physical version of EazyDraw. The latest version of EazyDraw is shipped on a high speed 16 GByte memory stick, includes the application, HD video tutorials, examples and work sheet tutorials. Purchase of 9 Month trial license in previous 2 months required. EazyDraw version 9 requires mac macOS version 10.13 or newer; other solutions on USB memory stick for macOS 10.4 and newer. Includes shipping by Priority Mail in the U.S., air post to other countries. Description: License upgrade from 9 month trial license to the USB memory stick physical version of EazyDraw with printed manual. The latest version of EazyDraw on a high speed 16 GByte USB memory stick, over 40 HD video tutorials. Purchase of 9 Month trial license in previous 2 months required. EazyDraw version 9, requires macOS version 10.13 or newer; memory stick contains solutions for macOS versions 10.4. and newer including PowerPC. Free shipping by Priority Mail in the U.S., air post to other countries. Description: License upgrade from any EazyDraw previous version single user license (not 9 month license) to full current single user version 9 license. Previous purchase of EazyDraw required. In the event of email address change please provide sufficient information for data base identification of original purchase in the comment portion of the order form. App Store customers are asked to provide Build Number in the comment portion of the checkout form. macOS version 10.13 or newer required. Description: License upgrade to full physical EazyDraw version 9. Previous purchase of EazyDraw required, any single user license but not 9 month license. In the event of address change please provide sufficient information for data base identification of original purchase in the comment portion of the order form. App Store customers are asked to provide the EazyDraw Build number in the comment field at checkout. Includes EazyDraw version 9 and over 40 HD video tutorials on USB memory stick plus printed 400 page manual. USB memory stick has both EazyDraw 9 and 9-Retro, providing solutions for macOS versions 10.4 and newer including Mojave. Free shipping by Priority Mail in the U.S., air post to other countries. Get started immediately: a temporary license and download links are provided by email.